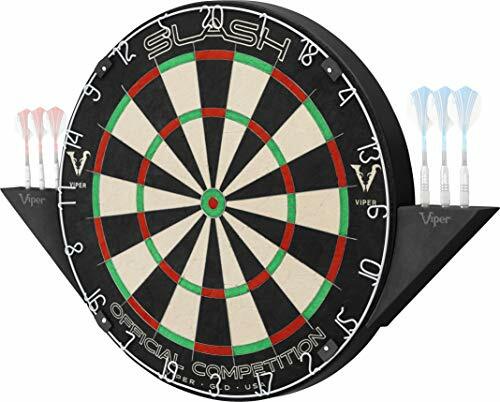 The flagship sisal dartboard from Viper is our most advanced dartboard yet. The Viper slash is constructed from the highest grade African sisal fibers, compressed to the highest density possible. These bristle fibers give the slash its self-healing properties, holes left from dart points seal back to pristine condition. The ultra dense sisal allows us to include the thinnest razor wire we’ve ever had on a bristle board. This razor wire increases the scoring area of each segment for higher scores and less bounce outs for a fast-paced game without stopping play. The razor-thin wire and Bullseye are free of traditional staples that can interfere with your game and cause bounce outs. Prepare for tournament play with the slash, its regulation size of 17.75 inch (451 mm) matches perfectly with high level event boards.